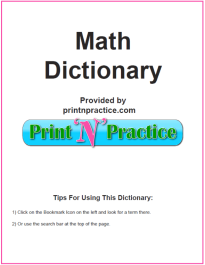 Our printable dictionary has all these Math words that start with A, as well as the other 25 letters. See the download at the bottom of this page. 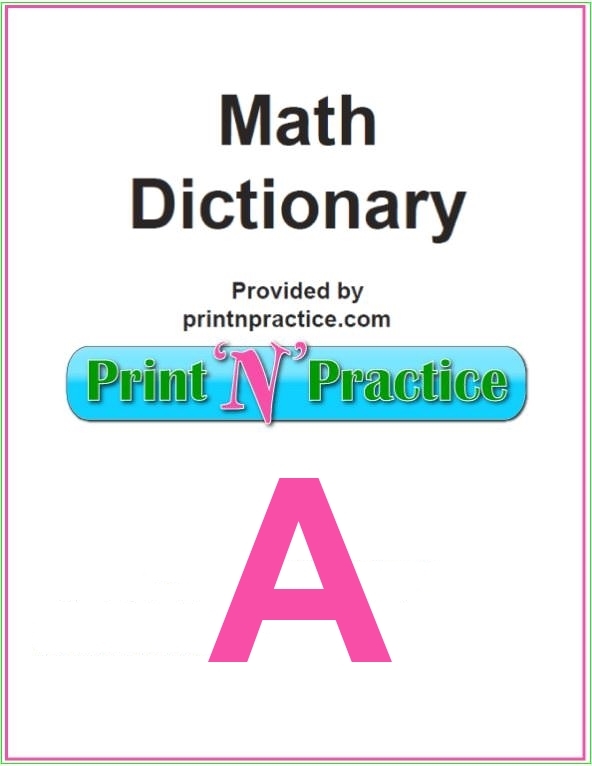 Math Words that start with A: Math terms for vocabulary and Math games. A.M. - the period of time from midnight to just before noon; morning. Abacus - an oriental counting device and calculator; a rack of ten wires with ten beads on each wire. Abelian group - a group in which the binary operation is commutative, that is, ab=ba for all elements a and b in the group. Abscissa - the x-coordinate of a point in a 2-dimensional coordinate system. Absolute Value - a number’s distance from zero on the number line. Abstract Number - used without reference to any particular unit. Abundant Number - a positive integer that is smaller than the sum of its proper divisors. Acceleration - the rate of change of velocity with respect to time. Accute Triangle - a triangle of which the largest angle measures more than 0o and less than 90o. Acre - a unit of measure used for measuring land in the United States. An acre is 43,560 square feet or 4,840 square yards. Acute Angle - an angle whose measure is less than 90 degrees. Addend - the numbers added in an addition problem, the operation of combining two or more numbers to form a sum. Addition - the operation of calculating the sum of two numbers or quantities. Additive Inverse - the number that when added to the original number will result in a sum of zero. Additive property of inequality - a property of real numbers such that, for any real numbers a, b, and c, if a > b, then a + c > b + c, and also c + a > c + b. Adjacent - means that two things are next to each other. Adjacent Angles - two angles that share a ray, thereby being directly next to each other. Agent - a person who transacts business for another. Algebra - a problem in which one or more number is unknown. Algebraic Equation - an equation in the form f(x)=0 where f is a polynomial. Algebraic Expression - an expression obtained by combining constants and/or variables using the arithmetic operators +, -, x, ./. Algebraic Number - a number that is the root of an algebraic polynomial. Algebraic phrase - a meaningful arrangement of numbers and variables. Algebraic proof - use of definitions, axioms, and deductive reasoning to prove algebraic assertions. Algorithm - step-by-step procedure by which an operation can be carried out. Alphametic - a cryptarithm in which the letters, which represent distinct digits, form related words or meaningful phrases. Alternate Exterior Angles - angles located outside a set of parallel lines and on opposite sides of the transversal. Alternate Interior Angles - angles located inside a set of parallel lines and on opposite sides of the transversal. Alternating Sequence - a list of numbers that goes positive, negative, positive, negative... or negative, positive, negative, positive. Altitude - the altitude of a triangle is the line segment from one vertex that is perpendicular to the opposite side. Amicable Numbers - two numbers are said to be amicable if each is equal to the sum of the proper divisors of the other. Analysis - the process of solving problems by tracing the relations of given results. Angle - the figure formed by two line segments or rays that extend from a given endpoint, also the measure of the rotation of a ray about its endpoint from an initial position to a final position. Angle Bisector - a ray that divides an angle into two congruent angles. Annuity - an investment where you put in a certain amount of money each year or each month. Annulus - the region enclosed by two concentric circles. Apothem - a line drawn from the center of a polygon perpendicular to one of its sides. Arc - portion of a circle. Area - the number that tells how many square units are contained in a closed figure, the amount of surface contained by a figure, Length x width = Area, lw=A. Arithmetic - the science of numbers, and the art of computation. Arithmetic Mean - the arithmetic mean of n numbers is the sum of several numbers divided by n (being the number of numbers). Arithmetical Operations - the various changes to which numbers are subject. Array - a rectangular arrangement of numbers or symbols in columns and rows; a polka-dot grid. Associative Property - this property applies both to multiplication and addition and states that you can group several numbers that are being added or multiplied (not both) in any way and yield the same value. It is a property of real numbers that notes that, for any real numbers a, b, and c, ( a + b) + c = a + (b + c) and (a x b) x c = a x (b x c). Automorphism - an isomorphism from a set onto itself. Average - refers to the arithmetic mean. Average Expected Payoff - an estimate of an amount that will be gained in a game of chance, calculated by multiplying the probability of winning by the number of points won each time. Axiom - a rule in math that is always true, or a statement that is assumed to be true without proof, also called a postulate. Axioms of Probability - there are three axioms of probability: 1. Probability is always more than zero 2. The chance that something happens is 1,or 100% 3. If two events cannot both occur at the same time, the chance that either one occurs is the sum of chances that each occurs. Axis of Symmetry - a line that cuts an object in half so that the two halves are mirror images of each other. Our words that start with A are worded for children in fourth through ninth grade and can be an awesome list for playing games like Scrabble. 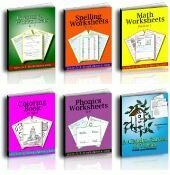 We also have five bundles of phonics worksheets with A words or words that use A in a phonogram blend. Thanks for visiting our Math words that start with A! 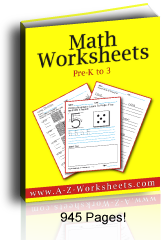 If you've enjoyed our Math words that start with A, you might also enjoy our many printable Math worksheets. These are not quizzes, but practice worksheets for learning the equations and formulas. Give them a try as they are all free on this website, or you can buy them in one downloadable bundle.